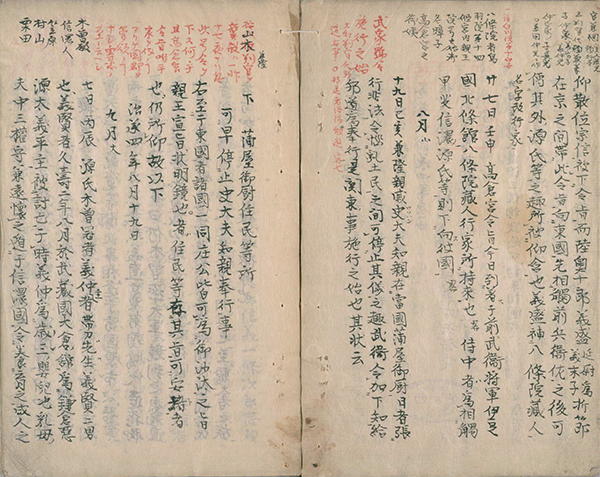 The Azumakagami is a chronicle of the Kamakura bakufu from 1180 to 1266. It was compiled after 1266 under the directive of the Hojo Regent (shikken; tokuso). Recently, nyûdô 3d court rank Yorimasa has been engaged in preperations for the subjugation of Hei Shôkoku zenmon Kiyomori. However, realizing the extreme difficulty of his own plan alone, he went secretly at night fall to visit the sanjo Takakura residence of Goshirakawa’s second son Mochihito accompained by his son Nakatsura. [Yorimasa] urged [Mochihito] to summon the former hyoejo Yoritomo and the Genji under him, and eliminate the [Heike] clan to rule the realm. Accordingly, [Mochihito] instructed 3d rank Munenobu and gave him the edict. However, Mutsu Jûrô Yoshimori Teijô Tameyoshi’s youngest son happened to be in the Capital; following orders he attached the edict to his sash and headed to the Eastern provinces, and after first presenting [the edict] to the former hyoejo, he transmitted its contents to the other Genji. Yoshimori was appointed as an administrator to Hachijôin. His name was changed to Yukiie. 27th day, mizunoe saru. Today, Mochihito’s edict arrived at Izu province, Hôjô estate of the former general of the Left Guards, brought by Yukiie the hachijôin administrator. Wearing formal dress, Yoritomo first bowed towards Otoko yama in the distance, after which he respectfuly had the edict read to him. Yukiie went to deliver [the edict] to the Genji in the two provincesof Kai and Shinano. Accordingly, he left for these provinces. 24th day, kinoto no mi. As for the Yasunobu’s report that after the defeat of the laymonk (nyûdô) 3d rank Yorimasa there was a directive that the Genji in the various provinces ought to be pursued, because one should not regard it as an unfounded report, to the cotrary, [Yoritomo] ordered to devise a plan to destroy the Heishi. Accordingly, he sent a messege summoning hereditary housemen. For that he used Tô (Adachi) Kurô Morinaga and had Kochûtai Mitsuie accompany him. The Commander of Guards arrived at Kajima in Suruga province. The Lesser Captain Koremori, Satsuma no kami Tadanori, Mikawa no kami Tomonori and others put up a camp on the West bank of the Fuji river. However, half way thru the night, Takeda Tarô Nobuyoshi devised a plan and turned his troops, and as he stealthily proceeded to attack the said camp from the rear, birds gathered on the Fuji river. The sound of their wings seemed like a forceful army. Because of that the Taira were surprised and agitated, and now the Lesser Captain Kazusa no jô Tadamori and others confided and said the following: “The warriors of the Eastern provinces joined in to the request of Yoritomo. We thoughtlessly left Kyôtô and on the way we are already in a danger of encirclement and escape. We should return to Kyôtô at once and devise a different plan.” Following this advice Koremori and the others, not waiting for sunrise, quickly returned to the Capital. 21st day, kanoe ne. Because it was necessary to advance to the Capital in order to pursue an attack on Koremori, Yoritomo oredered his warriors to that effect. However, Tsunetane, Yoshizumi, Hirotsune and others disuaded him saying: “Satake Tarô Yoshimasa and similarly the Kanja and others in Hitachi province have yet to submit and can lead an army of hundreds, especially, Shirô Takayoshi, father of Hideyoshi, who supports the Taira and resides in the Capital. Moreover, there are many proud men still living there. Therefore, first overcome the Eastern barbarians (*the Chinese used to call their enemy “barbarians”) and then proceed to the Kansai.” Consequently, Yoritomo ordered to move to Kise river and lodge there. Recently, some tens of thousands of warriors accompanied the Heike in bothe the Western Sea and Northern Mountains ways, and took positions in Ichi no tani along the borders of Settsu and Harima, forming lines on both sides. The two Genji forces arrived at Settsu province. By the hour of the rabbit they decided when arrows began to meet (i.e., the battle started). The general kanja Noriyori led the troops attacking the front. The accompanying bands were Oyama Shojirô Tomomasa, Takeda hyoejo Ariyoshi, Itagaki Saburo Kanenobu, the Shimokôbe estate official Yukihira, Naganuma Goro Munemasa, Chiba no suke Tsunetane and some 56,000 troops. The general Minamoto no Kurô Yoshitsune led the forces attacking from the rear. Accompanying him were Ômi no kami Yoshisada, Ôuchi saemon no jo Koreyoshi, Doi Jirô Sanehira, Miura Jûrô Yoshitsura and some 30,000 troops. 7th day, Snow. At the hour of the Tiger the lord Minamoto Kurô first weperated 70 brave warriors who arrived at the mountins behind Ichi no Tani. Now, Kumagai Jirô Naozane, a resident of Musashi province, Hirayama mushajô Hideshige and others devised a way to reach the western side of the Ichinotani residence secretly, advancing from the coastal way to the Kansai. The Minamoto were first in camp, announcing their names outloud opened the enterance of the outer gate and engaged in battle. After that, Noriyori (kanja), Chitsu..., Miura and the Kamakura bands raced in, and as the Minamto and Taira warriors were in mutual chaos white banners mixed with red banners, and in the course of battle mountains vibrated and the earth moved. Even if they were the Chinese generals, inflicting defeat would not be easy. Lord Kurô accompanied by Miura Jûro Yoshitsura and other courages warriors attacked from Hiodorigoe. Because of their assault [Heike warriors] were thrown into confusion and fled, either departing Ichinotani on horses, or turned towards Shikoku on boats. The two Kantô generals sent a courier from Settsu province to Kyôtô, informing that the other day a battle in Ichinotani was accomplished; nine generals were beheaded, and some one thousand troops were executed. Thus informing.